RAILWAY CARRIAGE PRINTS MASTER. This is the definitive list of carriage prints in PDF format. Whilst on the subject of un-used artwork, it’s surprising what sometimes turns up when taking a closer look at items in the collection. 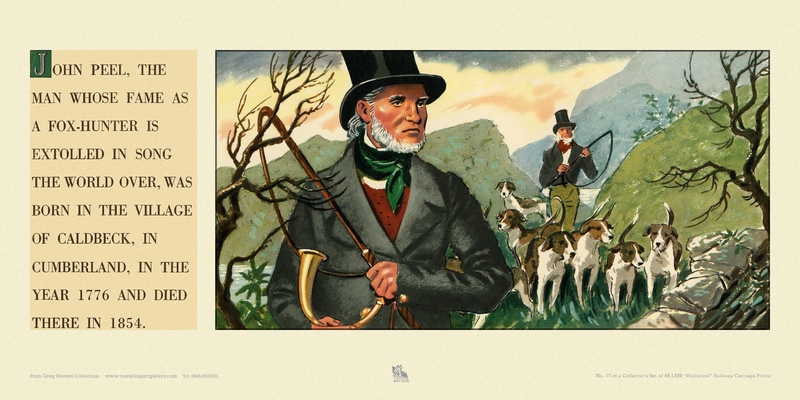 Going through the original artwork for the LMR Historical series recently, I noticed that Bill Sawyer had produced two separate artworks for the John Peel, Fox Hunter carriage print… . The artwork for the un-issued print is shown here with the issued example – perhaps the uniforms were found to be wrong on the first one – who knows? Anyway, to save years of wasted effort by collectors – don’t go looking for original prints of this, or any of those I have listed with a grey surround – there aren’t any! With the very kind help of visits by the Kilvington family, we have now catalogued all the pre-grouping, grouping, BR & LT carriage adverts, notices, maps and diagrams in the collection and this past month has finally seen the completion of sorting and cataloguing all the photographic carriage panels dating from the 1880s through to the end of the grouping period when they finished producing them. Sounds daft, but this is the very first time many of these panels have been properly examined by myself and the data and measurements obtained has given me a far greater understanding of what formats many of the railways used in displaying them. I’m sure some interesting articles on specific companies with illustrations could follow at a later date. One last random question to throw out to you before finishing, relates to the commonly seen print River Wharfe near Ilkley, Yorkshire by Gyrth Russell. We originally thought this was an amalgamation of views along the river around Addingham. A café owner there told me it was definitely a view of Burnsall Bridge further up the river and the bridge with its 5 arches certainly fits the bill although, having been there to photograph it, the artists viewpoint for the painting seems impossible to find! A correspondent has recently told me the location is Bolton Bridge further downstream, but this bridge only has 3 arches, so I’m none the wiser or convinced! Any reader’s clarification will be gratefully received! Notice of an exceptional special auction on Tuesday 13th December- a private collection of railway related artwork coming up for sale at Dreweatts & Bloomsbury Auctions, Newbury. Many of the original paintings for posters in the sale had been stored behind a wardrobe by an elderly lady in London for decades! Amongst the highlights in the collection are a number of original artworks produced for the LMS in the 1920-30s, an era (rightly or wrongly) known as the Golden Age of the railway poster, depending on your taste. One of the highlights is Venetian Nights, Southport, by accomplished Italian artist, Fortunino Matania, set on the Marine Lake, Southport in 1937. This large canvas, by the artist responsible for several classic LMS poster views of Blackpool and Southport, is something of a mystery as the poster has never yet been seen, despite an accompanying letter between the LMS and the printers showing a print run of 5000. 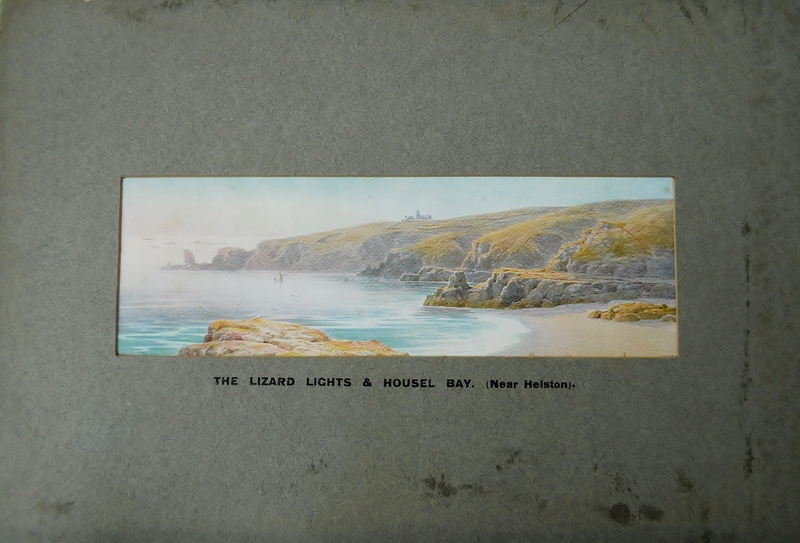 Other highlights include Norman Wilkinson’s superb and iconic, LMS artwork of Iona, Scotland; Verney Danver’s Southern Railway poster artwork of Bexhill, (the art deco De Le Warr Pavillion) (also never seen before); the original LNER poster artwork of Teesdale by Ernest Haslehust and Algernon Talmage’s view of Bournemouth for the LMS. Wartime poster artworks, including a train crash in France by the White Star Line artist, Montague Birrell Black and other artwork by Rowland Hilder also appear in the auction. I have been fortunate to be able to obtain nine more original carriage print artworks recently, including two of my all-time favourites: Whitby, Yorkshire by Rowland Hilder and Sible Hedingham by Leonard Squirrell. I’ve often wondered where some of the artwork got to after going to the printers many moons ago and the paintings do surface from time to time, especially in batches. Most have been stashed away, unframed, and have never seen the light of day for decades. A two day trip to the NRM recently, to go through their carriage panel archives with that most helpful of curators, John Clarke, was something of a challenge, but thoroughly enjoyable and, hopefully, beneficial to the museum and myself in exchanging useful information on the collections. The most interesting by-product of going through the NRM collection to add to the catalogue information was how important the measurements of the adverts, photographs, notices are in ascertaining the frame size and therefore the company likely to be responsible for the panel, particularly if there is no other information to go on. Some pre-grouping companies panels survived in large amounts, whilst it is exceedingly rare to find anything from other large concerns. Talking of going through collections – a heartfelt thanks to the Kilvington family from Walsall who visited here and were a great help in the long-overdue task of sorting my own collection of adverts, maps & notices recently. Most items hadn’t been looked at since purchasing! The next task is to catalogue the lot! Several years ago I finally got to the bottom of what the grouping and BR companies had actually issued as carriage prints and the complete and definitive list is on my website with dates, artists, series and a separate list of any discovered carriage print artwork produced by the artists, but never issued as prints by the railways. Wishing a happy and healthy new year to all readers. 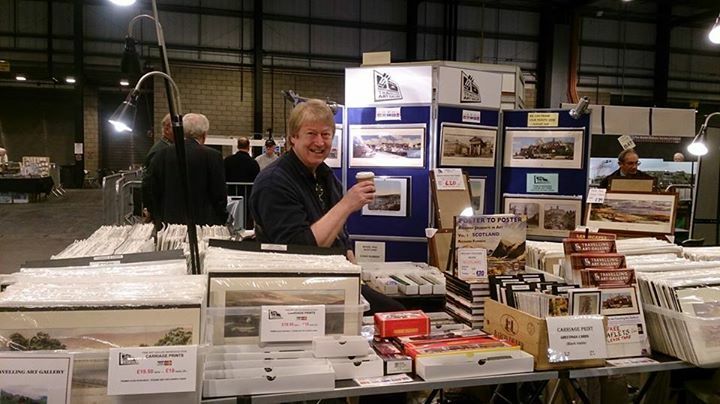 EXHIBITIONS & LECTURES We have had an exhibition stand at several model railway exhibitions recently and are due at the Glasgow Model Railway Exhibition in February and the London Show at Alexandra Palace in March as well as at Stoneleigh. As I mentioned in the last blog, Marie and myself are keen to explore other avenues this coming year to introduce the genre of railway carriage prints, posters and commercial art to a wider audience, including the fine art market. In November I travelled up to the N.R.M. to hear a lecture on their carriage panel collection by a university student, with a couple of other talks on railway subjects by speakers arranged by head curator, Ed Bartholemew. Mike Priestley was there [thanks for the interesting recent article in RAG on modern BR posters, Mike] and I was encouraged by the attendance and the evident interest shown, as well as how many people I talked to afterwards who were unaware of the subject or the ‘Landscapes’ book – now 8 years out of print. It all helped to give me the kick up the backside I needed to get moving and produce the 3rd edition next year! Prices of rarer carriage prints have held up reasonably well in the past year, but, as auction reviews show, post-war prints struggle – most railway collectors have the particular ones they are after. However, it does make it a great time to fill in any gaps or to collect new areas. As I mentioned, we are keen to introduce new collectors into the marketplace and new books and a video are planned. I’m hoping to do some filming this spring with Nick Crane, the TV presenter on a short video on the subject of carriage prints and commercial artists. Having a professional video maker as a son helps me of course! Nick has recently been appointed President of the Royal Geographical Society and is a busy man but hopes to be involved. Having purchased quite a few original artworks for carriage prints in the past year, I have finally got round to scanning and examining my collection of paintings. Some interesting observations came from this. Red Hill Tunnels, Trent by Kenneth Steel has the title in capitals ‘Watford Tunnels’ on the cover of the artwork! (It looks like the artist’s writing, but I can’t be sure). The watercolour of Crafnant Valley, Caernarvonshire by Charles Knight solved a long-standing puzzle: I have always thought that this was a composition of several views by the artist and, despite a couple of expeditions to the end of the valley, have never been able to see any view comparable. In pencil on the back of the painting I found the words “Crafnant Valley from Trefriw” and, lo & behold, looking at the great blessing that is now ours through Google Images, saw the same landscape from the exact viewpoint, showing Klondyke Mill, visible in the painting. Google Images/ Earth is so helpful in research – indeed, you wonder how on earth people managed without the facility of the internet in days gone by. I actually purchased this painting a couple of years ago from a friendly man in Holland near the German border who had contacted me via the internet. I never did find out how it had ended up there. 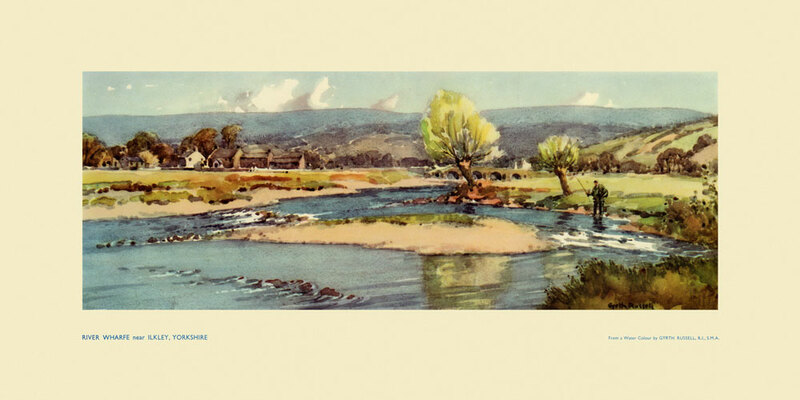 The painting of The Groves at River Dee, Chester by Reg Lander solved the reason why the artist hadn’t appeared to have signed his artwork on the smaller 20 x 10 prints – he had, but the printer’s crop marks left his signature outside the print area! The identity of the artist responsible for Penrhyn Castle and the Lledr Valley, nr Bettws-Y-Coed still remains a mystery – nothing on the artwork for the latter to give a clue. The Penrhyn artwork was sold in a railway auction years ago – a bit of a long shot – but does the owner know of any clues on the artwork as to which artist was involved on this painting? 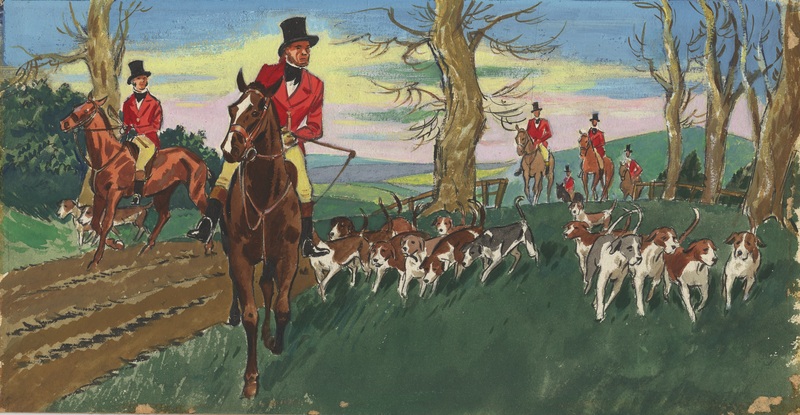 One other surprise was finding two different paintings of John Peel, the Fox Hunter by Bill Sawyer from the LMR Historical series in the collection! One must have been rejected for an unknown reason – possibly the wrong uniforms shown on the huntsmen? Twixt Christmas and the New Year, we spent a few days in the post-flooded, but still sodden, Lake District at Keswick. It was great to see the old station and canopy standing and used – the last time I was there was just after the line had closed). We had just got past Glenridding on the way out before the road flooded again. Both the exact locations for the carriage print locations of Coniston Water (Frank Sherwin) and Lake Windermere (David Cobb) proved very difficult to identify and photograph. Having driven completely around Coniston Water and slipped up to my ankles into a furrow of liquid mud after a walk, I wasn’t too keen to explore too wide an area but we got some idea of the landscape. I suspect that the view is from the south eastern side of the lake near Crake Valley looking across to High Nibthwaite and the Water Park buildings. Definitely, needs another visit unless anyone can confirm? The Lake Windermere painting is either a fabrication by Cobb or a view of another lake (there is nothing written on the original painting to suggest either). The closest alternative I can see would be from the south east part of Grasmere looking northwards towards Fairfield Peak. Any wisdom from readers would be appreciated. Thankfully, the other central Lake District views are rather more straightforward. Always good to find out more information on the poster and print artists – someone emailed me with comprehensive details of the poster artist, Kerry Lee, renowned for his detailed artworks for city map posters. Richard Furness’s excellent research into poster artists, combined with my earlier research on the carriage print artists has produced a very useful database of commercial artists – an area with surprisingly little available information to hand, even on the internet. Ebay occasionally turns up a gem and last month produced a lovely panel with gilt edged mount with triple photographs from the Metropolitan Railway with ornate scripted title at the top. The first of its kind I had seen. I was delighted to get it close to my initial bid, despite completely forgetting to leave a higher bid in case of later competition! I’ve set a target to finally get round to sorting the advertisements, maps and diagrams in the collection this year. Should be interesting! All the images of the carriage prints and photograph panels are on display online, now at larger sizes with larger maps to view, too. For example there are over 350 LMS sepia panels (with another 50 on the way) and over 2,500 photo panels overall – as well as all the carriage prints – a useful database of information, so do browse the www.travellingartgallery.com website – no cost involved!. Enjoying a coffee at the Scottish Model Railway Exhibition at the Scottish Exhibition Centre, Glasgow. Very successful time and many new and friendly people met over the three days. We’ve tried to explore new avenues of sales possibilities over the past year and have introduced the genre of railway carriage prints and railway posters and commercial art to a wider audience. Next target area will be the fine art & craft market. Difficult to know where to start in this field. Does anyone know of any recommended exhibitions to go to on national or local (East or North East England preferably) level that will fit well with this genre? Will all be grist to the mill. The BBC One Show have just contacted me and are using the original artwork of the Stealing of the Crown Jewels by Colonel Blood by Harry Winslade in a forthcoming programme on the subject of the audacious thief. It’s surprising the types of request from the media that arise – one day it can be for an image of Whitby for a Dracula movie, then this! I am currently working on a short video on the subject of carriage prints. Buying a camera drone for my youngest son’s documentary videos for his church has given me a certain leverage – (ok – yes – its a fair cop, it’s blackmail). Some footage of the landscape above the cliffs at Robin Hood’s Bay and Old Harry Rocks in Dorset will be spectacular, I’m sure! I’m hoping Nick Crane, TV presenter of Coast, Town and other programmes will lend a hand at some stage. He’s very enthusiastic about the subject and has a vested interest, in that he’s a relative of the carriage print artist, Freda Marston, and collects her work. Found another item of original artwork for carriage prints – Britannia Tubular Bridge, North Wales by Kenneth Steel RBA, SGA. The paintings are gradually coming out of the artwork. Not sure whether I’ve mentioned this already, but I have a facebook page on the subject of carriage prints which (confession time again) I am also awful at uploading frequently. As my school reports frequently said: Must do better, can do better, should do better…. I’m sitting writing this latest epistle from a model railway exhibition at Peterborough. One of my targets this year has been to try exhibiting at several new and different events to bring the world of railway and commercial art into a wider sphere of influence, outside the usual railwayana marketplace. It’s quite interesting to meet the many people who are unaware of the existence of the world of carriage prints and railway posters – even people from a railway background. The next event will be our first attempt at the National (Warley) model railway exhibition at the N.E.C. in November, which promises to be a busy affair. We hope to venture into some art exhibitions next year. I was very sorry to hear of ‘the clock man’, Ian Lyman’s passing away recently. He was local to me in Northants, living not far away in Kettering, although I only got to know him in the last few years. He was more than helpful in putting me in contact with collectors and finding local items of interest and struck me as being a very genuine man. A few original carriage print artworks have turned up recently. I have been notified of the River Thames, Kings Reach by Frank Mason, Hitchin, Herts by John Moody, Cley, Norfolk by R E Jordan, King’s Lynn by Gyrth Russell, Blythburgh, Suffolk by Henry Denham, all in private collections and Norwich, Pull’s Ferry by Kenneth Steel appeared in auction in Norfolk recently and was purchased by an aging and eccentric enthusiast – many thanks to that most helpful of Norfolk collectors, Paul Thurtell, for collecting it for me! I know of only two other living carriage print artists – David Cobb, the former President of the Royal Society of Marine Artists (R.S.M.A.) and Ronald Maddox, President of the Royal Institute of Painters in Watercolours (R.I.). Much of my time in the past month or two has been spent sorting a large deceased estate. It has been a sobering (and pretty exhausting) exercise going through countless boxes of railway ephemera, hardware, books, clocks, cutlery, chinaware etc. amassed over many years. Many of the boxes look as if they had been brought home over 50 years ago and never or rarely sorted or looked at. It has been with somewhat mixed emotions as I’ve gone through each box – a sense of real gladness that someone had bothered to save so many items that would have otherwise been destroyed; feelings of sadness that the owner never saw or enjoyed the fruit of many of their labours; and the excitement and sense of privilege in sorting an historical treasure trove of railway history. The phrase “You can’t take it with you” is an oft used and, sometimes, trite expression but, nevertheless, a simple fact that often gets neglected in its implications. Much of the material I sorted probably originated in the early 1960s from the old Bishopsgate Stores – a massive archive of GER, GNR, GC, LNER, BTC and early BR ephemera and documents housed in the old former Eastern Counties Railway, London terminus at Shoreditch. It was latterly a goods and stores depot and was destroyed by a massive fire on 5 December, 1964. 40 fire engines were unable to save the buildings and the stores and archives were destroyed with it. I have many official railway press photographs of the fire which give some idea of the size of the area, which later lay derelict until 2003 when cleared for building work, including a new station. Q) do readers know what the letters D.N.A. stand for?……. Phew… a long time since the last post – my April wedding arrangements took priority I’m afraid… oh dear, what a poor excuse! I have spent some enjoyable times recently with Nick Crane, the TV presenter of Coast, Town, and several other travel programmes. He’s a relative of Freda Marston, the only female carriage print artist and I have been helping him in his collection of her artwork and prints. Like many other artists just after the war, Freda had to take on commercial work to survive. Nick is a very genuine and enthusiastic chap and a real pleasure to be with. We are hoping to do a small TV feature on Freda’s work at some stage, whilst visiting the carriage print locations she painted. Other artists’ relatives visited recently have been Claude Buckle’s son, Terence, and wife Andrea – again, very enthusiastic collectors’ of the artist’s work and good friends. Wenonah Driscall, Jack Merriott’s daughter, has been in contact, too, and with the families, we have managed to get together a fair collection of Jack and Claude’s paintings over the years. When I have finished the now long-overdue, hopefully improved and definitely expanded third edition of Landscapes under the Luggage Rack I aim to finish and produce books on both Buckle and Merriott. I met Alasdair Macfarlane’s granddaughter a couple of times recently. I had purchased an original oil painting of his “MV Loch Seaforth at Armadale“ and then found out that it was the original artwork for the BR/ Caledonian Macbrayne “The Fast Route to Skye” poster which delighted Rosemary and Peter, her husband, no end, especially when it ended up in their possession. Continuing on with artists, it was a great surprise to see the studio of Cyril H Barraud come up for sale in Canterbury recently, considering he died in 1965. I successfully bid on the phone for several lots of his non-railway etchings. He was a prolific etcher , mainly for book illustrations, and many of his views, especially of London, are quite stunning. Etching was a real skill and some of the carriage print artists such as Frank Mason and Kenneth Steel had a real grounding in this form of art. Included in the sale were a few of the original copper plates where Barraud’s scenes were engraved before the application of ink and the production of the finished pictures. One of the great treasures in this sale was two examples of his original coloured etchings for the pioneering 1936 LNER series. Both these images must have been rejected by the LNER as, as far as I am aware, they were never published by the railway. I recognised one immediately as Aysgarth Falls, Yorkshire but Richard Furness helped me to identify the other as Harrogate, Yorkshire [ ]. Fascinating to see these two views and I can only assume that the locations were omitted to leave a simple balance of eight views each by both Mason and Barraud in this series. I have added these two etchings to my listing of un-issued carriage prints which is now visible and available via my Travelling Art Gallery website. One of the interesting aspects of the materials in the sale was the use of different trials for colour washes used by Barraud in the production of his etchings. Colours of trees and mountains were changed to get different effects before reaching satisfactory results. Whereas the lithographed carriage prints varied little in colour and tone (unless the printer had dozed off during the process! ), most etchings of the same subject can vary in tone and colour and it is unusual to find two exactly the same. Far fewer etchings can be produced from a plate than the later lithographic process. They are a great scarcity anyway, despite the fact that the LNER advertised and sold them through the Railway Magazine in 1936 and through their travel bureaux. Not surprising really, as they cost 10 shillings and sixpence each, unframed – more than a week’s wages then. It is generally recognised now in the art world that etchings are relatively undervalued compared to other limited edition artworks. SRA at Derby and GCRA at Stoneleigh seemed quite buoyant and saw relatively good prices for carriage prints considering the economic climate. Several new collectors helped things along and it’s been great getting to know some new faces. The continued female interest in the subject is a large factor in maintaining popularity for the genre and this was certainly demonstrated at the successful exhibition stand we had at the recent London Model Railway Exhibition at ‘Ally Pally’, despite the arctic blizzard conditions. Due to the need to visit Kent recently, it gave me the opportunity to photograph some of the carriage print locations in the county. Many of the subjects are clustered around Romney Marsh and it didn’t take long to drive around most of the places and photograph them on what was a rare, sunny day in February. The only really awkward location turned out to be the Cinque Port of Hythe. The Martello tower featured in the image is still there, close to the fishing huts but, unfortunately, it now lies within the M.O.D. firing range and is fenced off out of bounds! I went as close as I could to the perimeter fence to photograph the foreshortened view and managed to attract some fierce and concerned looks from the guards in the security building! Perhaps in my next BLOG I may list all of the ‘awkward’ carriage print locations where photography is limited or involves restricted access, permission to enter a site, or the use of a boat to photograph the view! (Frank Mason was the chief culprit of the latter scenario, without doubt). I would be happy to pay for any successful photos of these places if photographed from the exact spot the artist was placed for the painting or as close as you can get if circumstances dictate or your life is in danger in the process! Anyway – more of this in the next BLOG. PS I have listed a lot more artwork and prints on my website recently, so do visit www.travellingartgallery.com to see what’s available. Just started my sporadic (in effect, yearly!) mailout to customers and supporters reminding folks I am still in the land of the living, so a warm welcome to new readers if you have not visited this BLOG before and been enticed here by my mailout. As Stan Laurel said…” You can take a horse to water but only a pencil can be lead”. For the collectors of original carriage prints – I hope to be adding some new and rarer examples to the list on the Travelling Art Gallery website over the next couple of weeks. This should include many of the Hamilton Ellis “Travel In series, if I can work out the technicalities of adding these (don’t ask me to explain – too involved!). More original artwork by the artists should also be appearing, too. Thanks for looking at the BLOG and kind regards to all readers.